Nylon stringed classical guitars have an ageless appeal regardless of the genre of music you play. Classical players require a larger string spacing to accommodate their precise fingerstyle playing. Combined with the smooth, full tone of nylon strings, Washburn's C5CE will meet the needs of demanding classical and flamenco players alike. Coincidently, classical guitars have found a home with beginners due to the easy on the fingers feel of the low tension nylon strings. 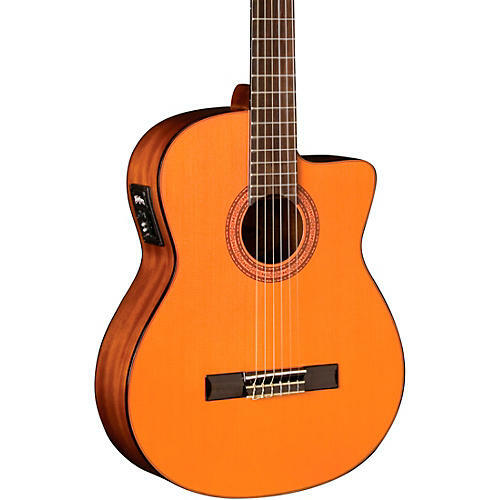 Regardless of your ability, a Washburn C5CE classical guitar will help you reach the loftiest of musical goals.